You can integrate ActiveConvert directly with Constant Contact. 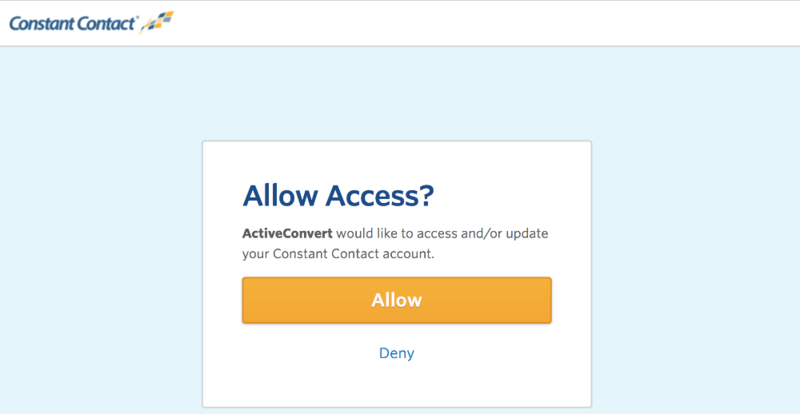 This means all leads and subscribers collected by ActiveConvert can automatically be added to your selected Constant Contact email list. 2. Click on the link to authorize access to Constant Contact and login to your Constant Contact account. 3. Once authorized you'll be redirected back to our integrations page where your integration will be enabled. Simply select the list you'd like to add contacts to in the dropdown. Finally, click Save. 4. You're all set and your new leads will flow right into your Constant Contact list!